As the curtains go up on football’s greatest extravaganza the FIFA Football World Cup we look at six of the players to watch out for. At 22, Timo is a forward player, who can be the one who can help Germany retain the FIFA world cup title. He has proven his capabilities by spearheading the team to the Confederations Cup triumph June 2017. Widely believed to be the focal point of Germany’s attack, he has already scored seven goals in 12 international tournaments this season. 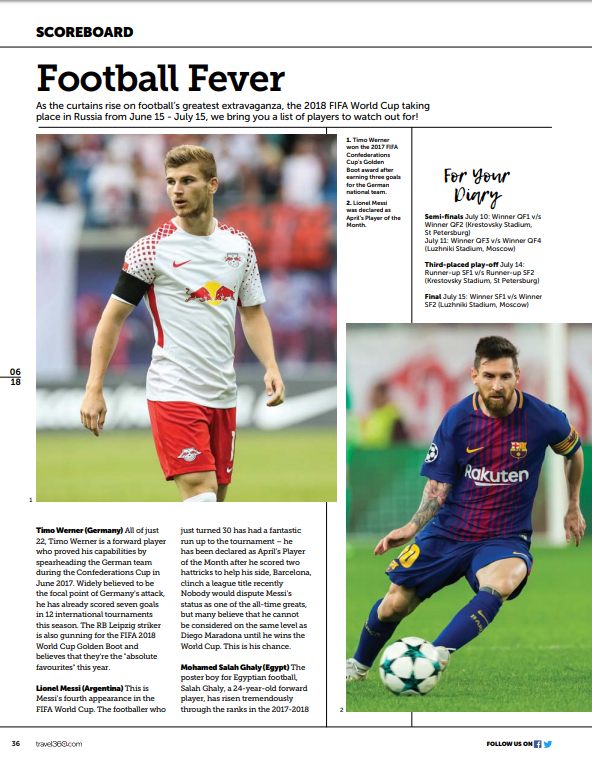 The RB Leipzig striker is also gunning for the FIFA 2018 World Cup Golden Boot and hopes 2018 will be his best year ever. Another strong contender to lift the cup, Brazil has Neymar who moved from FC Barcelona to Paris Saint Germain last summer. Undoubtedly the star of the team, this 26-year old scored the winning penalty against the Germans in the Olympic Games in Brazil. Widely compared to football legend Pele, Neymar has scored 28 goals from 30 appearances this season. The world’s most expensive football player, he has also been picked up by TCL Multimedia as its brand ambassador. The poster boy of Egyptian Football, Salah, the 24 year old forward player’s stature has risen tremendously in the 2017-2018 season. The pace and technique of this Liverpool’s player came to the forefront when he scored a last-minute penalty against Congo that ensured that Egypt’s 28-year wait to qualify for the World Cup finals finally ended. In this season he has scored 43 goals in 50 appearances. 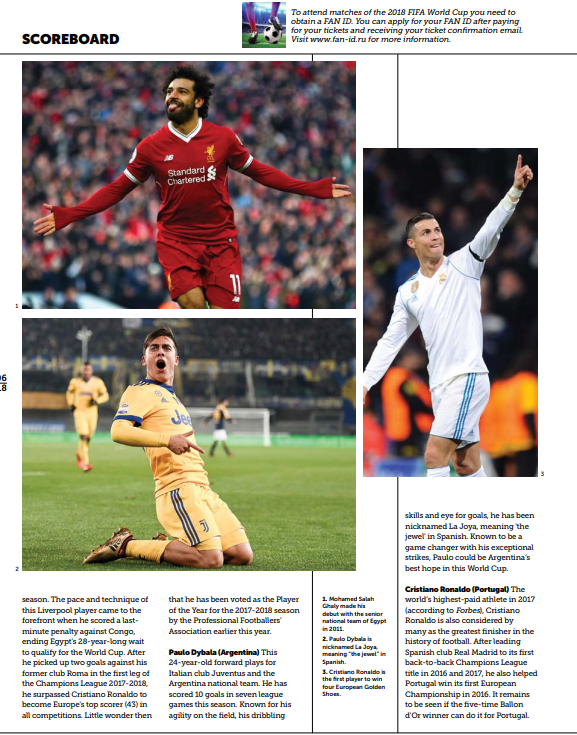 After he picked up two goals against his former club Roma in the first leg of the Champions League he surpassed Cristiano Ronaldo to become Europe’s top scorer in all competitions. Little wonder then that he has been voted the Professional Footballers’ Association’s Player of the Year. The 24 year old forward player Paulo plays for Italian club Juventus and the Argentina national team and in scored 10 goals in seven league games this season. Known for his agility on the field, his dribbling skills and eye for goals, he has been nicknamed La Joya meaning The Jewel in Spanish. Known to be a game changer with his exceptional strikes, Paulo can surely be the Argentina’s best hope in this world cup. The world’s highest paid athlete, 33 year old Ronaldo is also the greatest finisher in the history of football. After leading Spanish club Real Madrid to its first back-to-back Champions League titles he also helped Portugal win its first European Championship that made Portugal rename its international airport after him! With 43 goals from 42 appearances this year, he has been acknowledged as a player for whom nothing is impossible and is counted among one of the best players in the world. Easily the best football player in the world, this is Messi’s fourth appearance in the FIFA world cup courtesy being technically perfect in the sport. The footballer who just turned 30 has had a fantastic run up to the tournament he has been adjudged April’s Player of the Month award after scoring two hat-tricks to help his side clinch a league title recently. The Barcelona forward is understandably under pressure as Argentina have not won the World Cup since 1986.